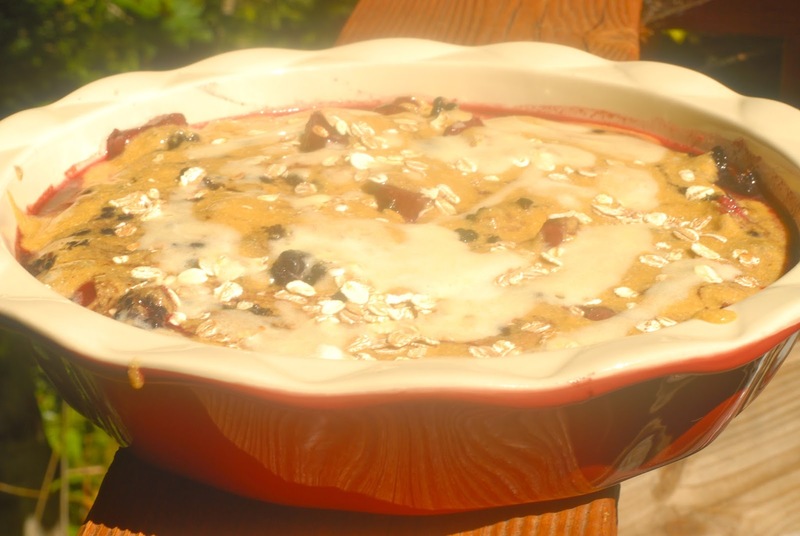 What a great dish for my first time cooking with and eating Rhubarb! The only place I’d ever heard of this red celery lookin’ thing being used was in Strawberry Rhubarb pie, but I’d never ventured a taste. 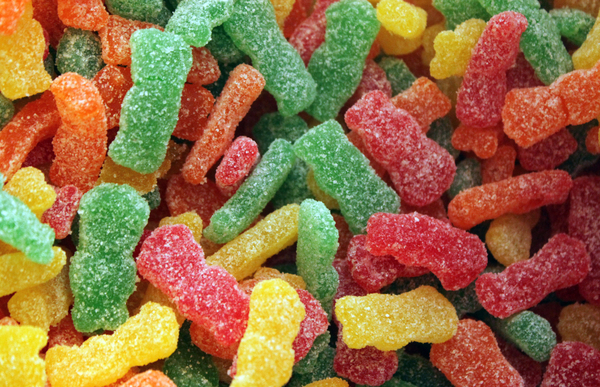 I’d heard it was tart and I love that sweet/tart combo… I used to inhale Sour Patch Kids in Highschool and College. You know, when I had the metabolism to support that kind of habit. 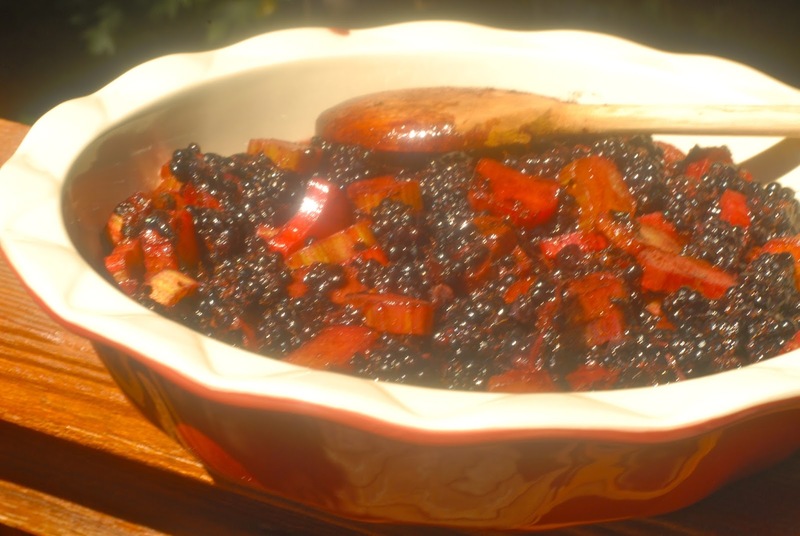 Anyhow, I had just picked some blackberries from our bushes outside and my friend had given me a ton of rhubarb from her garden, so I put the two together and voila! 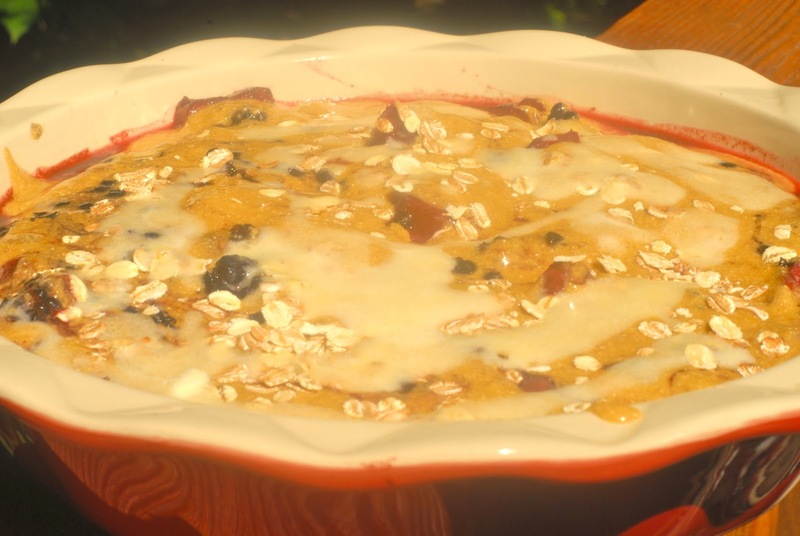 Blackberry Rhubarb Cookie Cobbler. 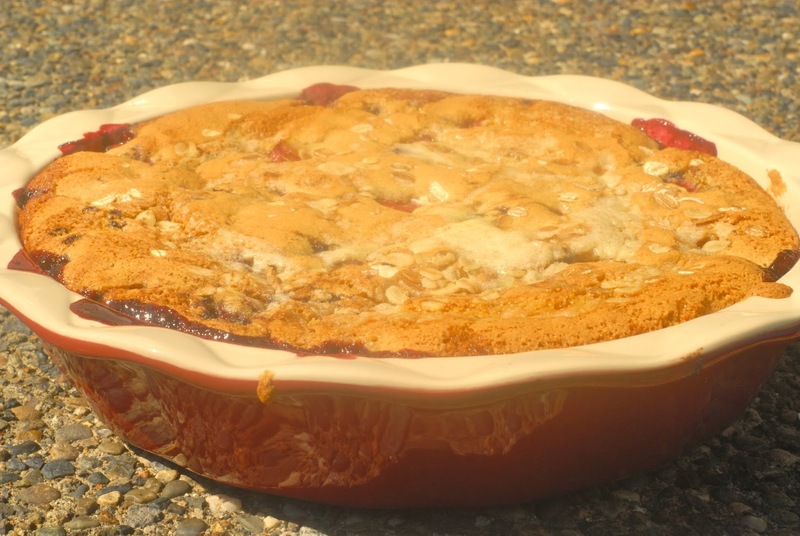 I did use some sugar since the two main ingredients were so tart, but I didn’t use any white flour and only a tbsp of butter (which can definitely be omitted), so you be the judge health-wise. WARNING: For some reason I thought ginger and cinnamon would be great in here. I used a lot of cinnamon and you could really taste it, and I loved it, but I love cinnamon and ginger, so you can reduce the amounts if you have a sensitive palate ;). These measurements are pretty flavorful (heavy?) on the spice. Heat oven to 375. 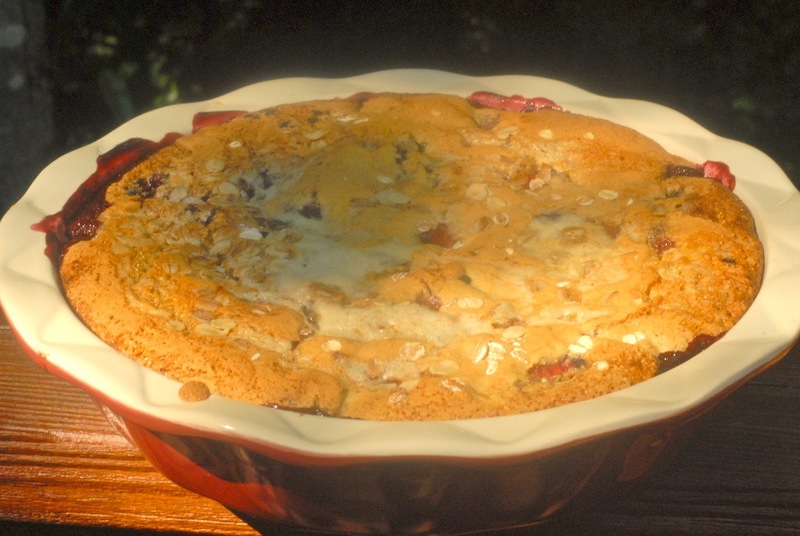 Grease your pie dish (I use coconut oil or coconut oil spray). 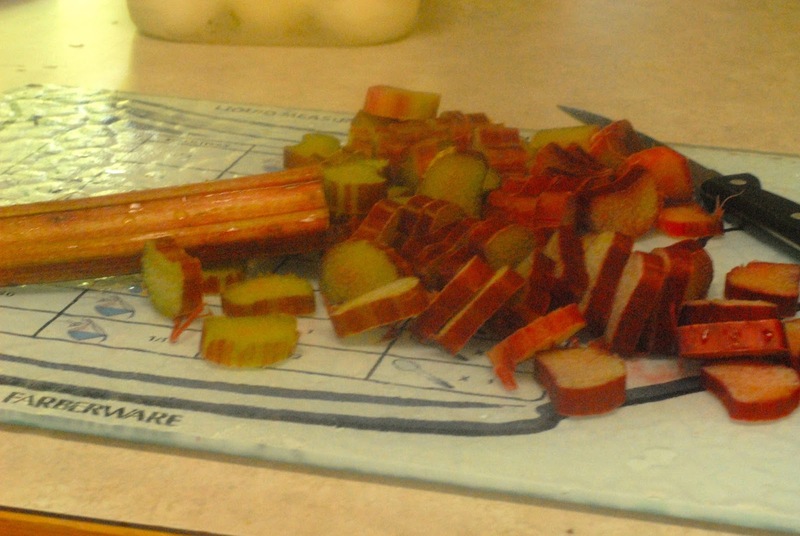 Cut your rhubarb into 1/4″ pieces like this. 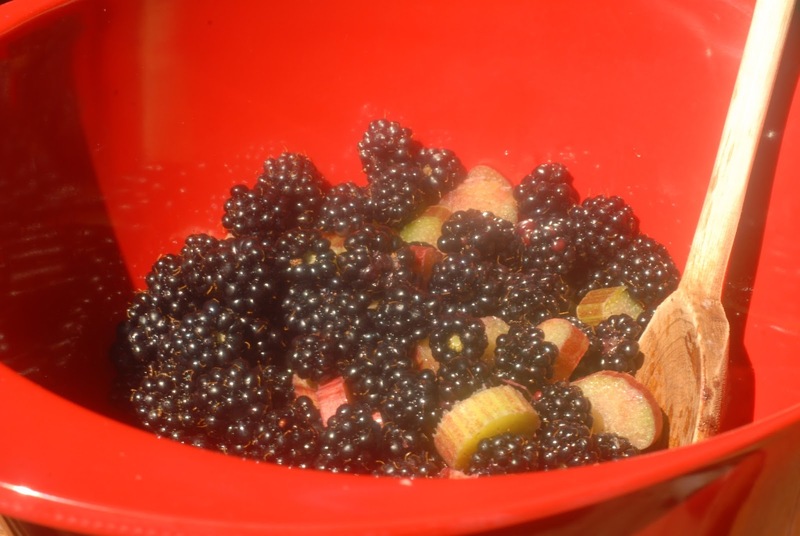 Combine the blackberries and rhubarb. Add your cinnamon, brown sugar and grate your ginger right into the bowl. I eyeballed roughly a tbsp. Remember, this is a very potent flavor! Feel free to reduce the amount. Mix gently don’t over mix! 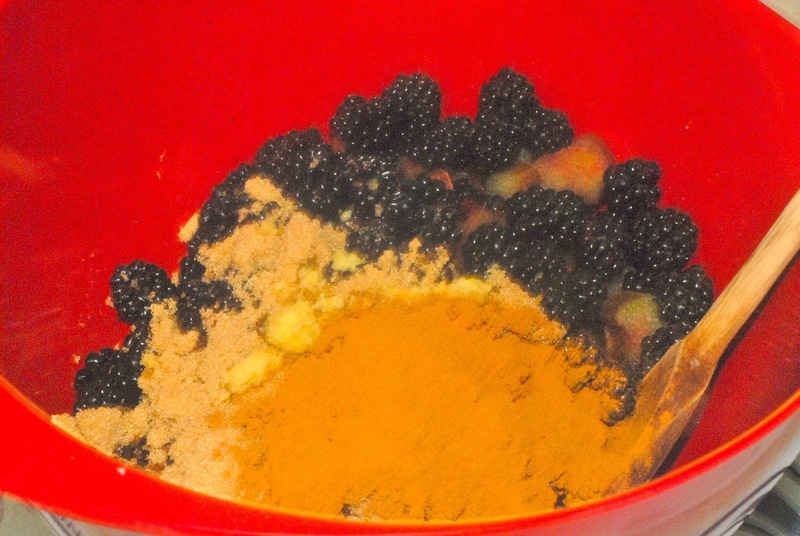 The berries will bust and all the spices will clump and it just won’t look as pretty when you cut into it :). 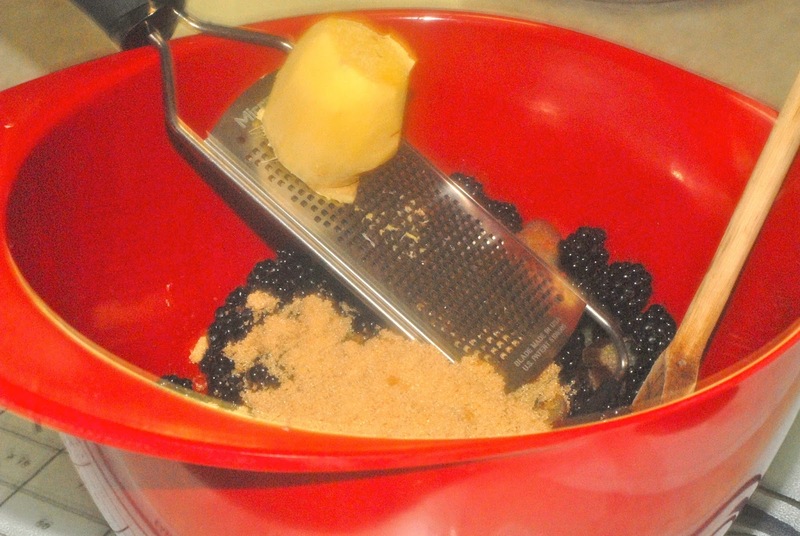 Pour the mixture into your prepared pie dish. 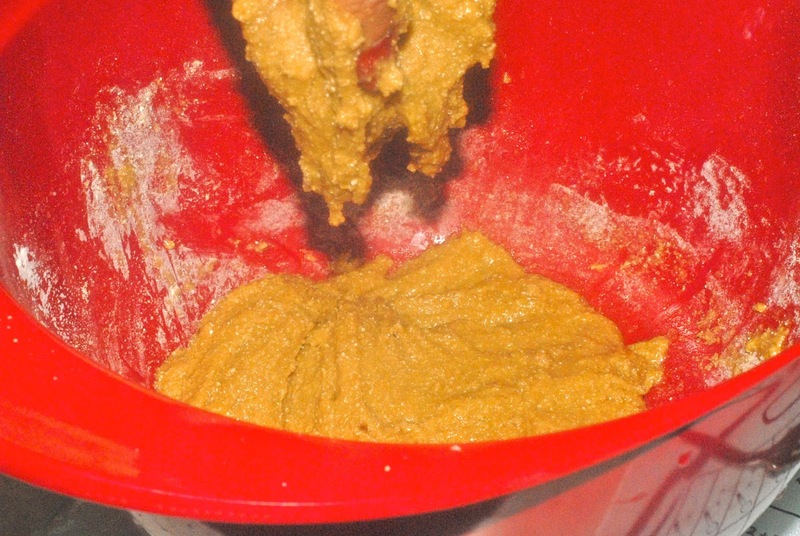 Grind and combine your flours, baking powder, brown sugar, cinnamon and salt in a separate bowl. 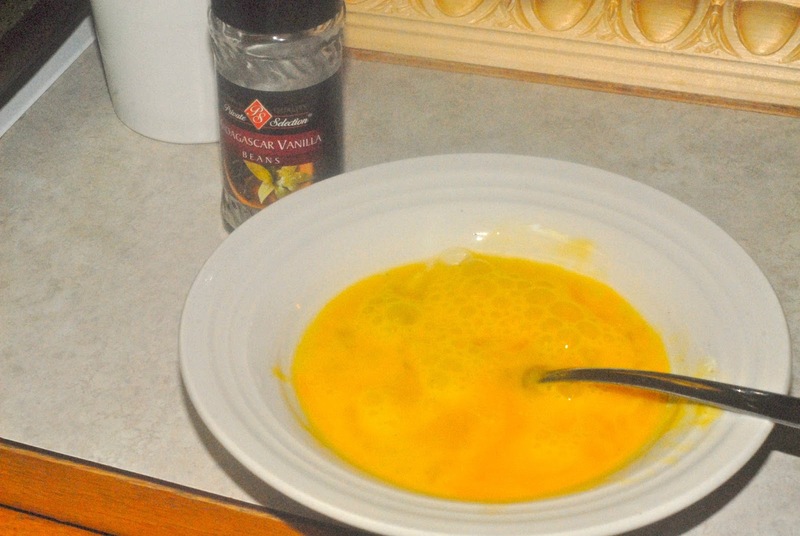 Beat eggs and vanilla in a separate bowl. 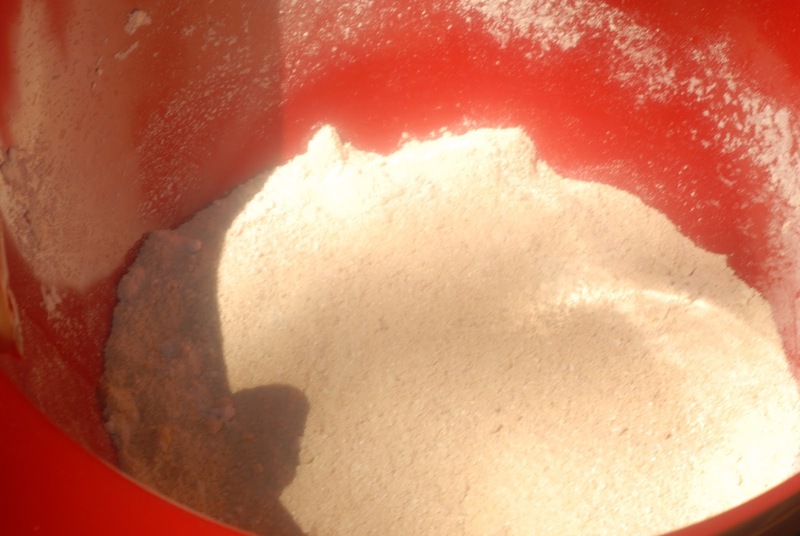 Combine egg mixture and flour until you get a relatively clumpy and pasty consistency. 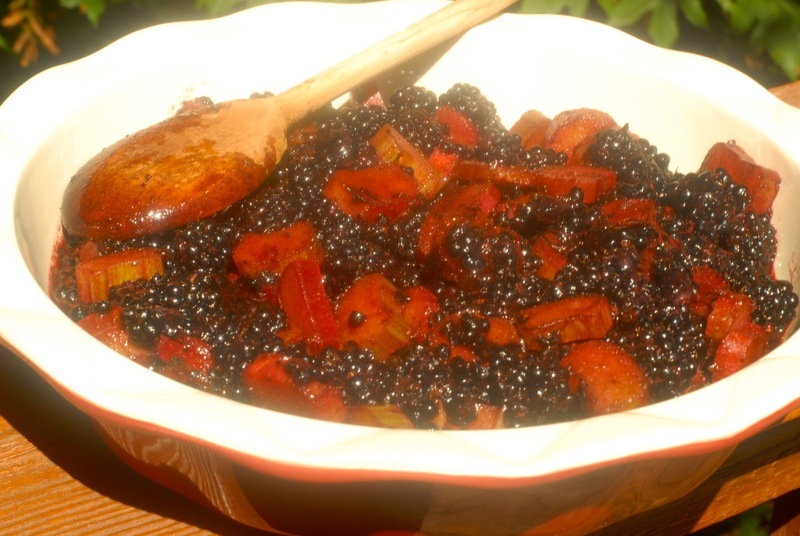 Bake for 40 minutes or until the top is crispy and the fruit is bubbly on the sides. 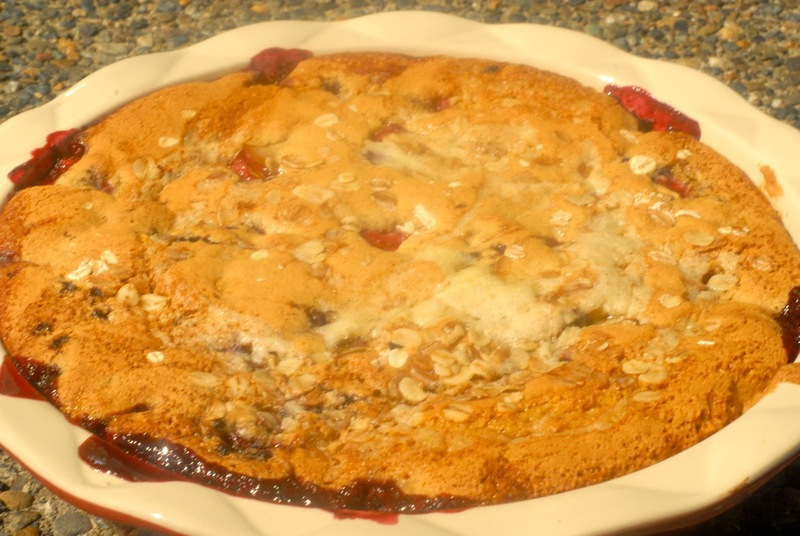 It will look like a giant cookie is on top of your berry cobbler! SO yummy. I didn’t even need ice cream with it! Took this to a BBQ at a friends house and it was a big hit! The different flours and spices gave it a pretty complex, but delicious flavor!